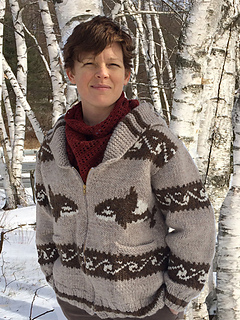 37 (40, 43 3/4, 48, 52 1/4, 56)"
This Cowichan-style cardigan features pockets and traditional construction: the back and fronts are knitted all in one piece up to the armholes, then split. The shoulders are joined with an unusual technique (shown with photos) and the V-neck grows into the shawl collar. The sleeve caps are shaped with short rows, then they are joined circularly and knitted to the cuff in the round. There are 6 sizes in this pattern and three colors in the garment. I have included photos and explanations of the techniques, and I have a video of the shoulder join on my YouTube Channel: . In addition, there is a schematic, charts, theory and technique boxes to help you understand the process of making this sweater, such as weaving the yarns in the back of the work every other stitch as the Coast Salish knitters do.